The home when the restoration work started. Photo by Eddie Lacher, Acworth Business Manager. 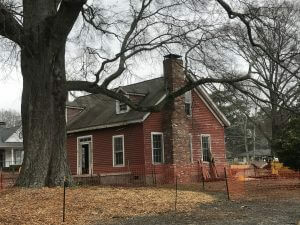 The beautiful, newly restored mid-1800s farmhouse next to Logan Farm Park will serve as a community events facility available to rent for weddings, receptions, corporate holiday parties and other gatherings. An Oct. 5 ribbon cutting was scheduled to officially introduce the city-owned farmhouse to the community. The structure and 30 surrounding acres were purchased by the city in 1998 on the courthouse steps. Much of the land became a park, and is part of the 140-acre Logan Farm Park. The old home, which was built in the mid-1800s based on a study of nails and other materials used in the home’s construction, sat mostly unaltered for years. After it was purchased by the city, it served as a catch-all for old sports equipment, outdated office items, lake buoys and other items. The parlor includes a display of items found on the property. The lack of alterations was a benefit to restoration crews. 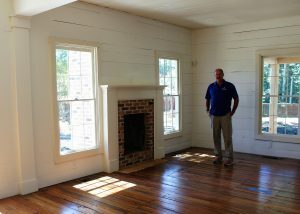 During the restoration, which focused on historical authenticity, crews stripped away old vinyl siding, drywall and false ceilings to reveal the home’s original wood walls and ceilings, according to James Albright, the director of Acworth Parks, Recreation, and Community Resources Department. The wood was in good shape considering its age, as were the home’s original pinewood floors, Albright said. The floors were refinished and the home’s large windows were sent away for repair. The replacement glass looks like what would have been used when the home was built, said Clem Freeman, Acworth Parks Operations Manager. Freeman credits Albright with the restoration’s attention to detail. “James has done an outstanding job, and he kept historical character at the forefront,” Freeman said. A new addition at the back of the home includes a large meeting room with a flat-screen television, restrooms and a catering prep kitchen. The facility will offer a list of preferred caterers for renters to use for events. A large wood deck extends from the addition and overlooks newly installed landscaping that includes ornamental shrubbery. The grounds were designed to complement the house, and to work well for events and photos. Albright said it was important that the home’s new and old sections blend, but be discernible. The roof on the old farmhouse consists of new wood shingles, while the addition has a tin roof. The stone foundation on the new and old sections of the facility are also slightly different. Clem Freeman in the home’s living room. Some of the rock used in the stone foundation pillars and reconstructed fireplaces was collected nearby from Tanyard Creek, which is how rock initially used in the house would have been collected, Freeman said. The original farmhouse has two stories. The front door opens into a long hallway and stairs that lead to small upstairs bedrooms. The bedrooms have wood floors and walls.The upstairs portion of the house will be closed to the public, but occasionally open for private tours, Freeman said. Downstairs, the main hallway opens to a parlor on the left and a living room on the right. The parlor will be decorated in period furnishings. 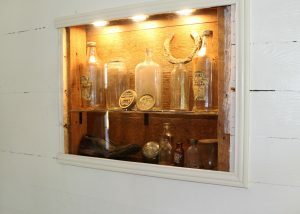 A wall display in the parlor includes items found on the property during restoration. 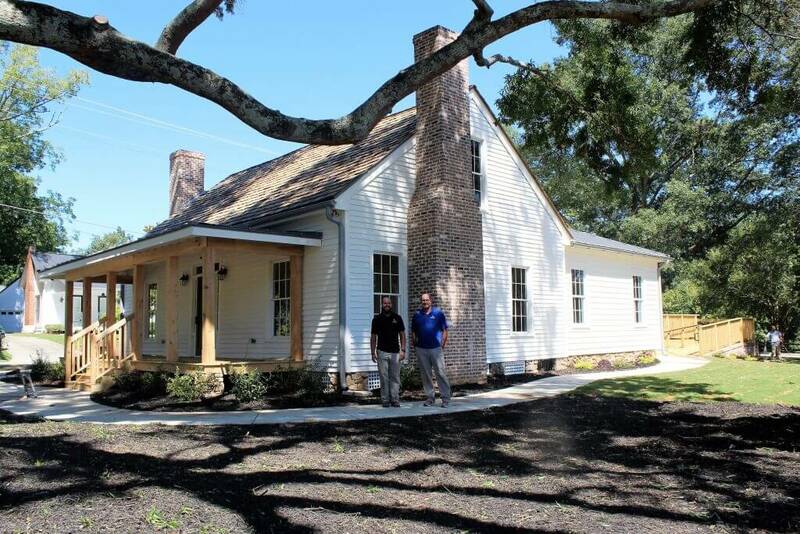 Nick Fryman, Acworth Athletics and Horticulture Manager, left, and Clem Freeman, Parks Operations Manager, at the farmhouse as restoration nears completion.